Prosecutor becomes a defense attorney after an innocent man is sent to an electric chair. A G-man goes undercover to infiltrate a gang, helping the group's leader escape from prison to gain his trust. A millionaire automaker retires upon the advice of his doctor, but becomes so bored he buys half interest in a gas station and works it on the sly. I only wish my mother were still alive so I could tell her I saw Helen Twelvetrees in a movie. I can just hear her now. "Helen Twelvetrees!!" That is a name out of the way, way distant past. 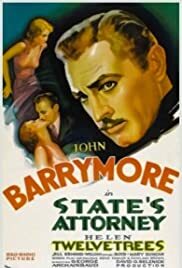 Twelvetrees appears in this precode film, "State's Attorney" with John Barrymore. Barrymore is Tom Cardigan, attorney for the mob. Tom falls for June Perry (Twelvetrees) and she becomes his mistress. She tries to redeem him. Tom's boss, Vanny Powers (Boyd), thinks Cardigan should become District Attorney. There, he can really get the fix in for Powers. Tom is elected He breaks up with June and takes up with the daughter (Jill Esmond) of a political boss, Ulrich. A big problem arises when Powers is arrested for murder and goes on trial. As far as Tom getting him off, it's going to be tough. June was a witness to the crime. Over the top courtroom scenes, the style of the day, take a major role in the film. Barrymore had a very modern acting technique - he is always wonderful and never seems overdone unless it's deliberate, like the impresario in "Twentieth Century." Always love to catch John Barrymore in a film. As a bit of trivia, Jil Esmond, who plays the political boss' Ulrich's daughter, was a British actress and the first wife of Laurence Olivier.